This blog is for material which doesn't easily fit elsewhere - interesting snippits, occasional photographs, research methods or tips. Material here may make its way onto the main site in due course. My initial response was that's easy, all but 3 were from Lancashire. Then I thought a bit. What about my ggm born in Co Durham in the 2 years the family lived there during the cotton famine? Weren't there some ancestors born just over the border in (whisper it softly) Yorkshire? 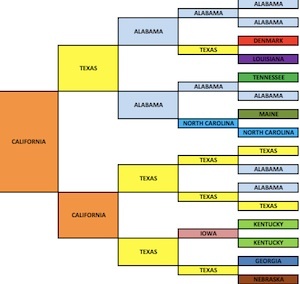 Would the ancestors from Stalybridge (yes) and Ireland (no) make the 5 gen cutoff? I was wrong that all but 3 were born in Lancs. Actually, 6 were, assuming that my unknown gggf wasn't born there. 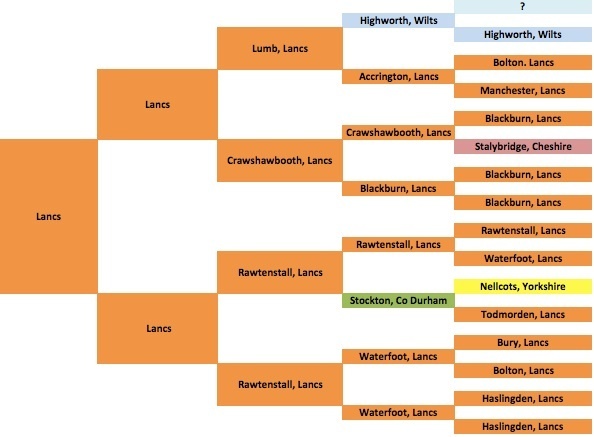 All but 6 of the ancestors, including the Yorkshire chap, were born in an 8 mile radius of my OPS place. (Todmorden was variously in Yorkshire and Lancashire - it was in Lancs at the time of my ancestor's birth). Manchester, although in Lancs, is 20 miles away. The main lesson however is not to assume that I know the answer without checking the facts. I was idly browsing through the Discovery catalogue of the National Archives, as you do, when I chanced upon file ED 32/471 containing records regarding the Mentally Defective School at Cloughfold. Interesting, I had no idea such an institution had ever existed. Ten days and a trip to London later I was presented with the records in a slim blue folder. There were 20 documents, mainly correspondence between the Education Board and the Education Committee of Rawtenstall Borough Council, and Inspector's reports. These charted the history of the school from a request that an internal gallery be removed in 1934 through its moving to a room within Cloughfold County Primary School in 1937 with the problems consequent on that to its eventual closure in December 1941. The school had apparently opened in October 1926 but that was sadly not recorded. This reminded me of some inpatient records I saw as a medical student which referred to people as 'an imbecile' or 'an idiot' or 'a moron'. Each of these had a precise definition in terms of IQ. 3. The process of closing a school. It became evident in 1937 that the school was not fit for purpose where it was but the numbers were such that building facilities fit for purpose could not be justified. All agreed that the school was non viable but the issue was the continuing provision for the remaining pupils. By October1941 a Dr Henderson, Schools Inspector, submitted a report which was scathing but nevertheless recommended that a letter be sent to the Local Authority congratulating them on the 'excellence of their service'! This report led to a memo requesting that a 'Mr Bosworth Smith' would 'look at' the report. Sadly his thoughts were not documented. By now the school 'must certainly close' with a beautiful note in the corner by another hand from 'Miss Elliott': 'I agree. It is an extraordinary state of affairs which should not have been allowed to go on all this time'. Indeed. Despite this, the Education Board reissued the school with a certificate in 1942. They later described this as 'inadvertent' and requested that it 'be destroyed'. 4. The effects of WWII, with the Education Board operating out of a hotel in Bournemouth. After closure, a memo from the Education Board suggested whether or not the vacated premises would be suitable for refugees. the response is unknown, but refugees were taken into the area during WWII, including some in Springhill itself. Sadly, I don't know where the school was located before its move to Cloughfold County Primary. I have been transcribing two databases recently, the Register of births at Sion Baptist 1811-1837 (unusual for a baptist denomination to record births - thank you Rev Heyworth, for doing so and including both parents' names and their abode) and the baptism registers for Newchurh St Nicholas starting at the 16th century (extracting for entries for Bridge and variant). In both cases I was struck by the number of references to illegitimacy in the registers. Only the registers have been considered, I haven't looked at parish chest or poor law records. illegitimacy can be assessed with reference to the illegitimacy rate (with reference to the number of women of child-bearing age) or the illegitimacy ratio (with reference to the total number of births in the population in question). As I have no indication of the number of potentially fecund females in the two congregations I have and to go with the illegitimacy ratios. Newchurch St Nicholas 1616-52: 17 illegitimates from 579 births i.e. 29/1000 births. This refers to all births, not just those from the Bridge family. Of interest, of the 122 baptisms of a child of a parent named Bridge between 1606 and 1738, 11 were illegitimate - 90/1000 births. Put it about a bit, the Bridges. the mother is described as 'concubine', single woman' or similar. For the Sion registers this includes the term 'aliter'. the child is given a surname other than that of the mother. Illegitimacy in the first half of the C17 has been assessed by Price as being at 7/1000 births, but the evidence for this is not stated. If so Newchurch was somewhat above this figure. Braddock postulates that low illegitimacy rates in the early C17 were encouraged in part by a strong system of local officeholders. It may be that the relatively sparse population of Newchurch at this time mitigated against this. Apparently illegitimacy was first assessed in 1842 at 66/1000 live births. It is said that illegitimacy rose almost threefold across C18, peaked at 1820s, declined then rose from the 1830s to peak in the middle of the century then declined until mid C20. It is said that socioeconomic rather than sexual factors drove the changes (Goose, 2006). Data from Vision of Britain suggests that, with a blip at the end of both world wars, illegitimacy remained pretty stable as about 5% between about 1910 and 1955, after which it gradually began to increase. It is interesting that the illegitimacy ratio was at least equivalent if not higher than national data for the C19 congregation of Particular Baptists. I have no data regarding the local ratios compared to national ones. That confounded my theory that this relatively strict congregation would be more chaste. Wonder if there was anything special about the previous April? McFarlane has published an interesting paper on the social situation of illegitimates in pre-registration times, with an emphasis on the Essex village of Earls Colne. Adair R, (1996) Courtship, Illegitimacy and Marriage in Early Modern England.